This is a trip I have been wanting to do for a long time. 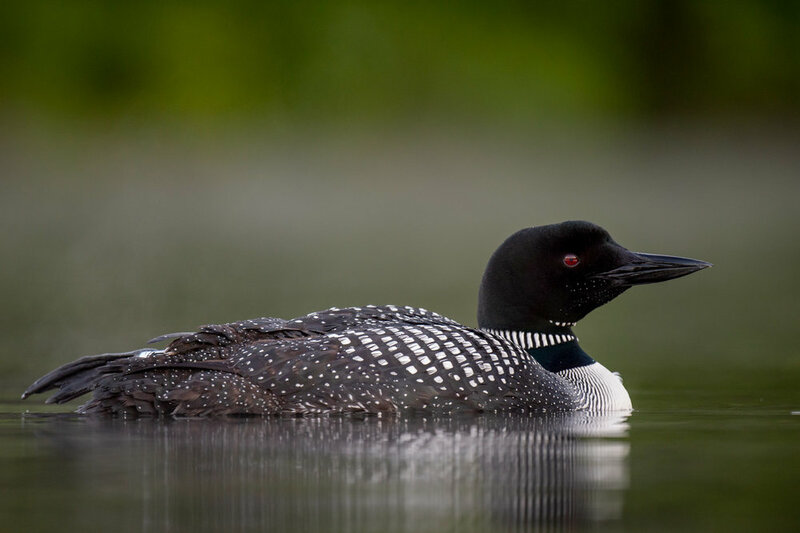 I remember seeing and photographing Common Loons in breeding plumage with my father probably 15 or more years ago. Of course those photos were horrible in quality but I still never forgot the birds. In southern New Jersey I get to see them every winter in their much more dull gray winter plumage. Every once in a while one will hang around long enough to just barely start showing some nice colors but then they are usually gone. In addition to just photographing the adults I really wanted to capture the chicks. I had seen photos of them being fed and riding on the back of the adult, how incredible would that be to shoot! 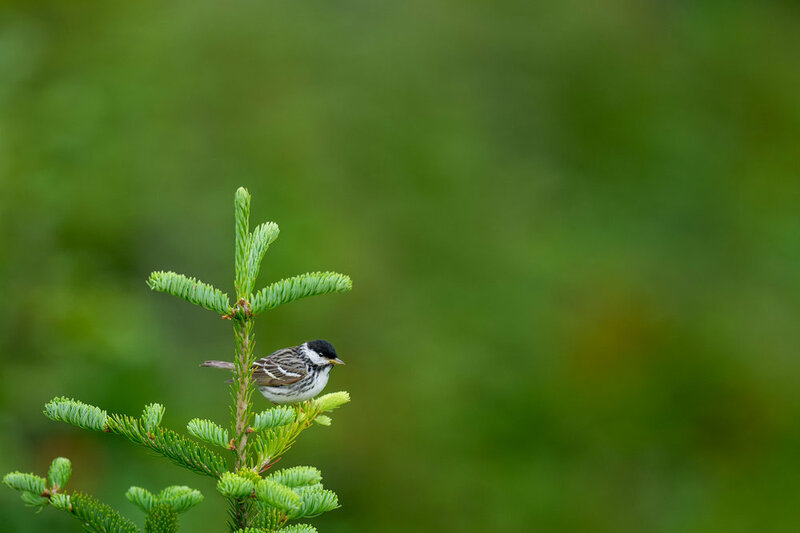 Earlier this year I finally put together the plans to make a trip north just to photograph these incredible birds and hopefully their chicks. I did a bit of research online, found what I thought would be a great area for them and invited my good friend Scott Keys. We had no idea what to expect when we got to our location but we both had a few shots in mind and I think we both secretly wished for a few dream shots but didn't want to say them out loud for fear of being disappointed. We met up nice and early one morning and began the drive north. About 7 hours later we arrived in the area and went to the first lake we were hoping to photograph the Loons on that evening. We pulled up and instantly realized how gorgeous this lake was. Scott grabbed his binoculars and quickly scanned the lake. In less then 10 seconds he said, "there they are, and with 2 chicks!" We both couldn't believe it might be that easy but were thrilled to see our first choice had what we were looking for. The light was harsh so we decided to check out a few more spots and then dropped our stuff off at the hotel. Later that evening we were back at the lake, kayaks and camera gear ready. It was time for our first attempt. Of course it wasn't quite as easy to find them now as when we had first driven up but it wasn't long before I came across an individual Loon with no chicks. The bird was a bit skittish and didn't let me get too close but it was still close enough that I had to grab a few quick shots. 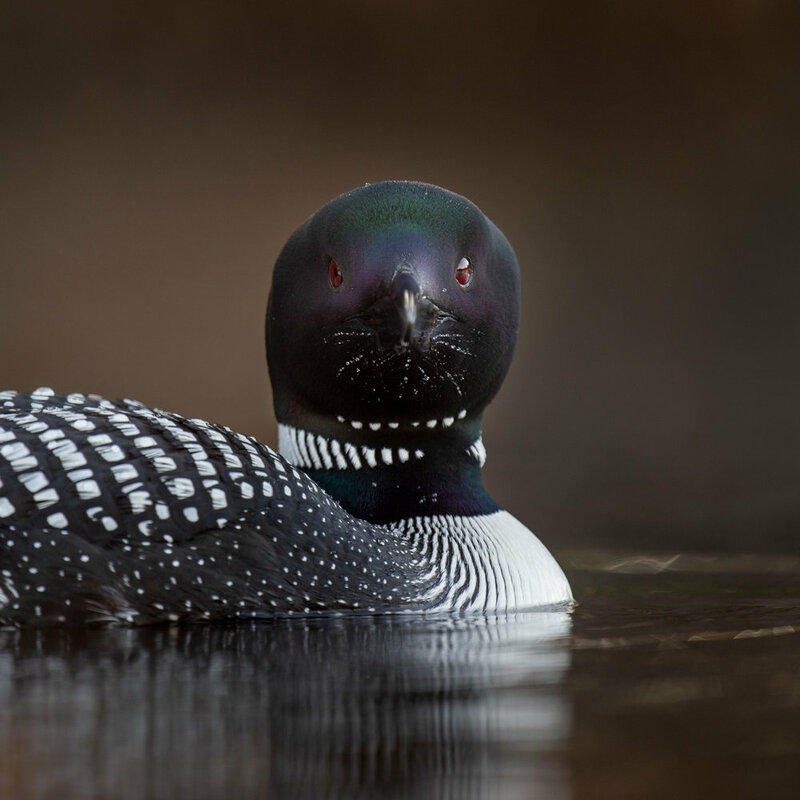 I had Loon fever and I couldn't resist! We started to paddle around a bit more and Scott thought he saw a pair along another shoreline. We headed in that direction and as soon as we were close enough we saw exactly what we wanted. A pair of adult Common Loons and a single chick with them. Our plan this evening was to get in the water and wait for them to head our way. We assumed that we would be less scary to the birds if we were in the water under some camo drapes vs chasing them around in the brightly colored kayaks. We didn't realized this at the time but we were dead wrong! We set up the gear and each waded into a spot that looked promising. Thankfully the water was warm and the bottom of the lake solid. It didn't take long for the alarm call to go out from one of the Loons, they knew something was off. We stayed put and before you knew it one of the adults was headed right towards me. It was obvious the bird was trying to lure me away from the chick. Once they all got some space things calmed down and the bird started to relax. They never came in close but they were close enough for some photos. As we sat in the water the evening light kept getting better and better. We were on the side of the lake that would get the latest sun which was ideal. 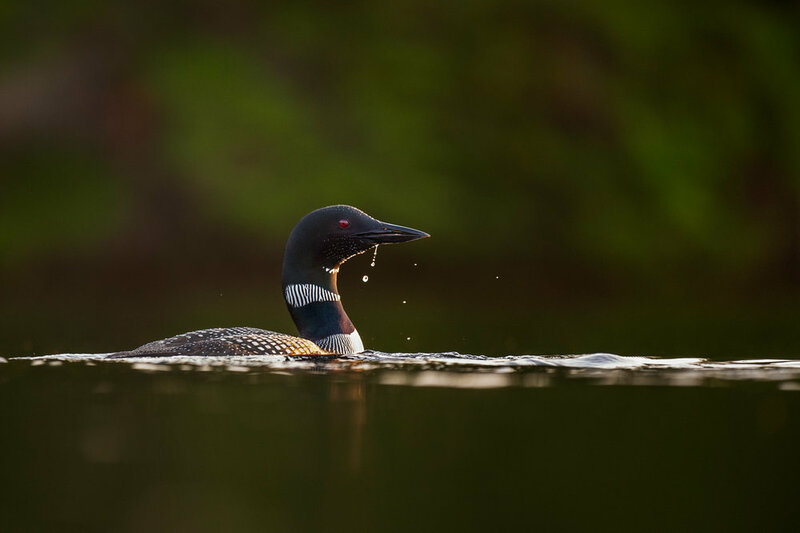 There were a wide variety of backgrounds as well as the loons swam around which was a great thing. 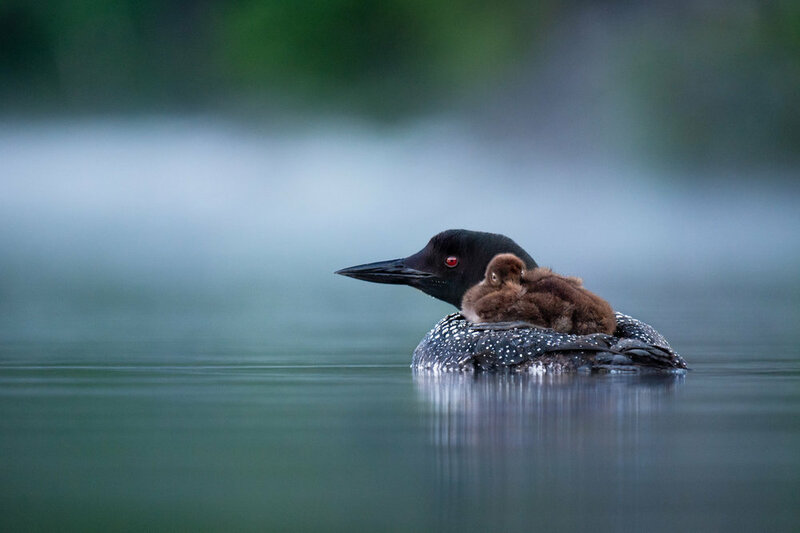 The baby loon was always swimming with at least one of the parents and we thought it might be too large to ride on the parent's back. We never witnessed any feeding either which I assume was due to the birds still being a slight bit uneasy with us in the water. Our plan got us some photos, some really nice ones but not quite the dream shots. 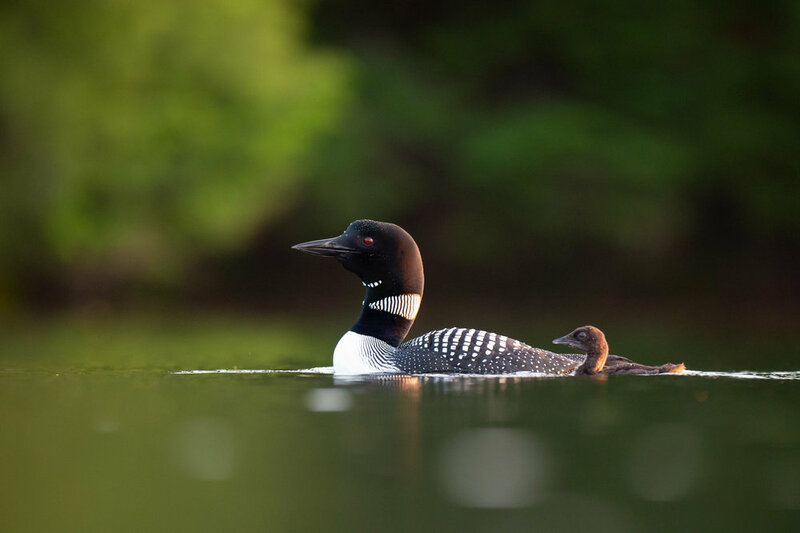 I had portraits of just adults, and adults with the chick in some amazing light, for our first ever attempt at photographing Common Loons with chicks it was already a success! It was an easy paddle back to the dock as I knew I already had some great shots so the pressure was off for the rest of the trip. 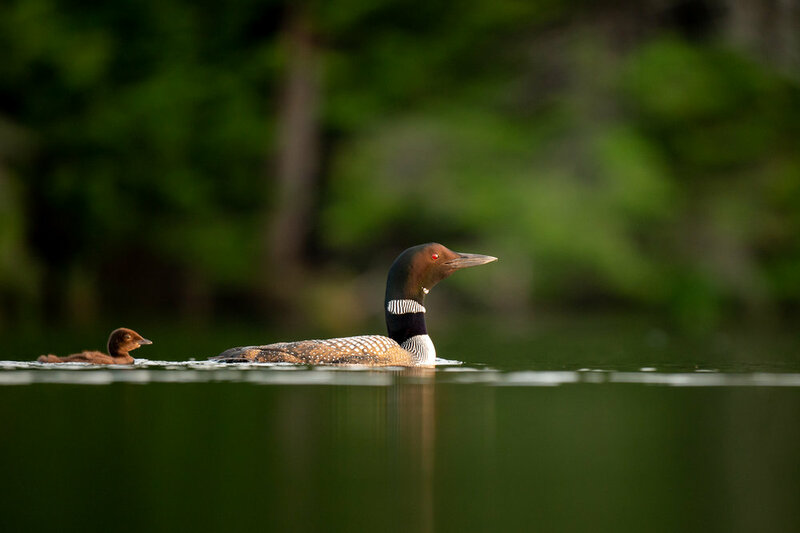 We had noticed during our time photographing the birds that another group of people had passed by the loons in kayaks and the birds paid them no attention. Seeing this happen would inform our next outing for them, no more getting in the water! Leading up to the trip Scott had mentioned here and there about trying for some warblers or other interesting species that we don't ever or rarely get in our local areas. While I like the concept of doing that since we would already be in New Hampshire my main goal was the loons. Thankfully we were both quite satisfied with our photos from the first evening so we planned the next day to visit Canon Mountain. 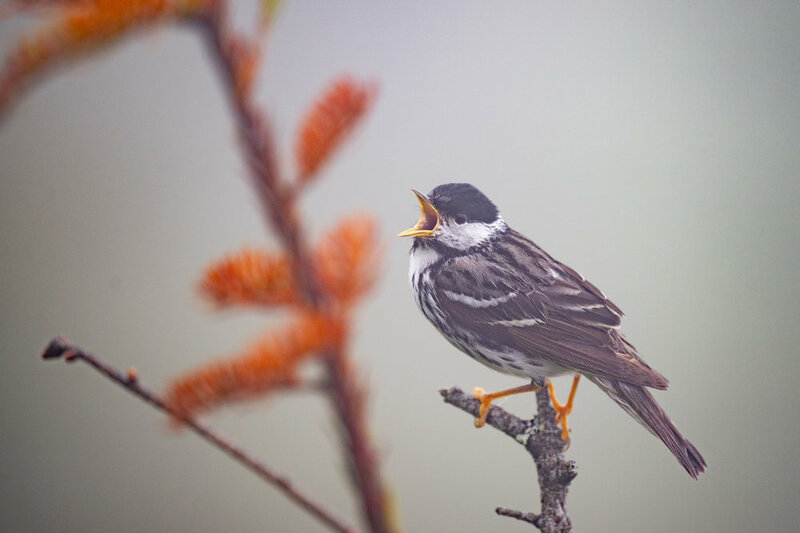 Scott had done the research and found this location to be a prime area for Blackpoll Warblers, our main goal. 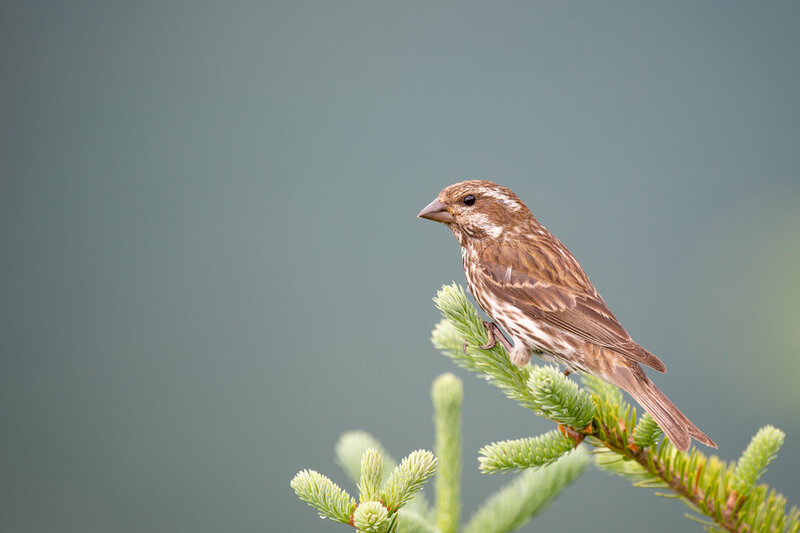 There was also a chance of Bicknell's Thrush and White-winged Crossbills. Again thanks to Scott's research he had found out that Cannon Mountain had an aerial tram that took you right to the top of the mountain. We arrived at the base of the mountain around 7:30am to a heavy rain. 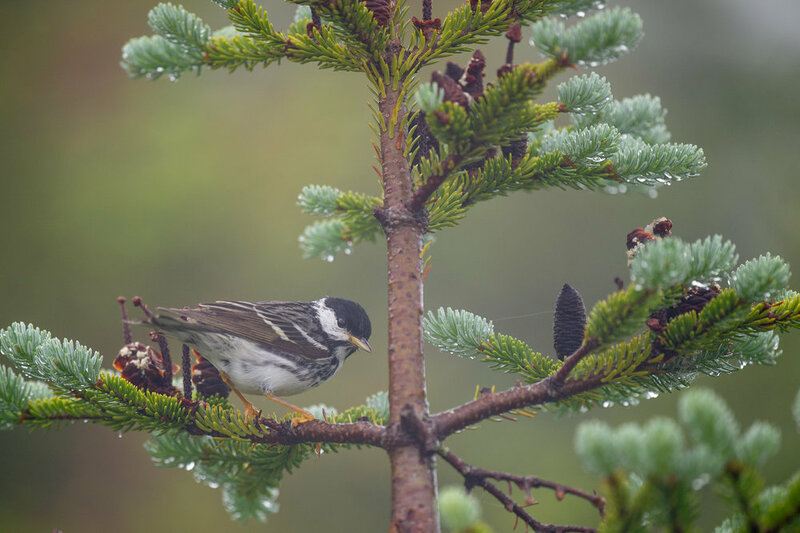 We were both prepared with rain gear for the cameras so it was no problem and we both prefer overcast for songbirds. We also figured it would help us have the mountain to ourselves, which was correct, we were the only ones on the first ride up. We walked out of the tram and onto the mountain which was completely shrouded in fog. We set up the gear and head off down a path to see what we could find. 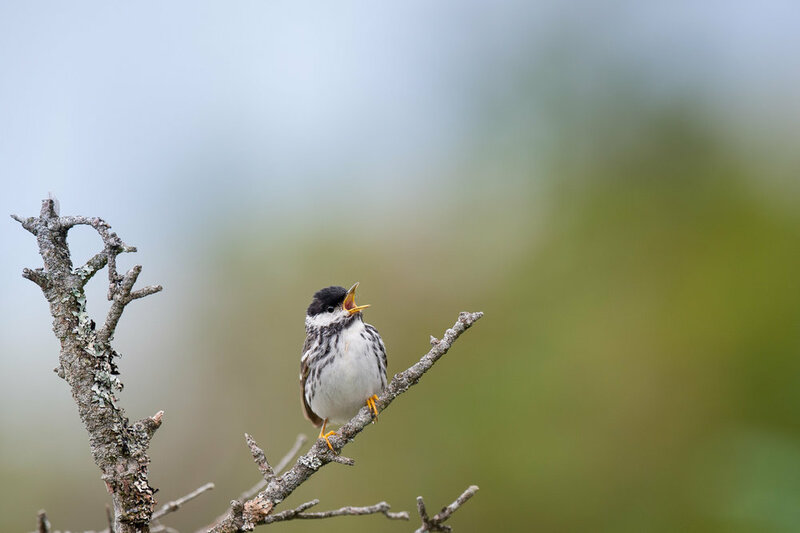 It was no more then 5 minutes and we had our first Blackpoll Warbler singing right along the trail. We couldn't believe our luck, this New Hampshire trip was making it all seem so easy, not how it normally goes. The dense fog made for some really tough photography but things would soon get better. 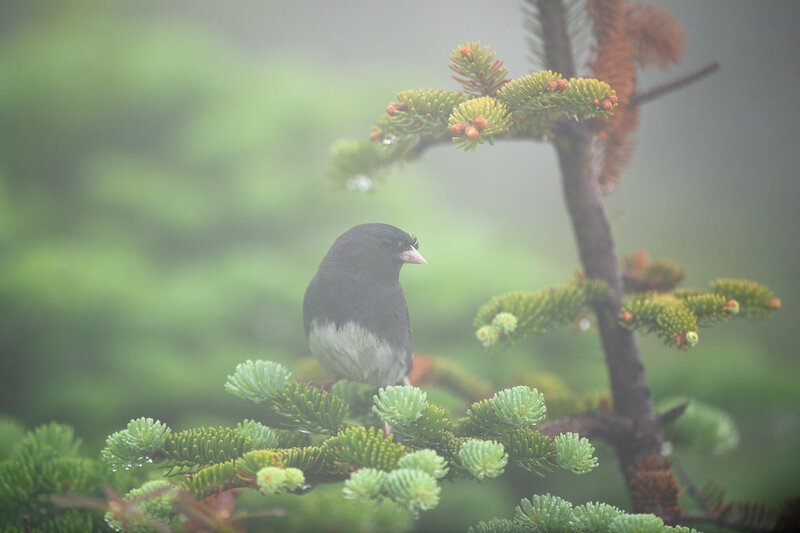 Initially the thick fog made for some interesting looking photos but it was very tough to focus and the birds had to be really close to see. We had a few Dark-eyed Juncos and even a Bicknell's Thrush show up. 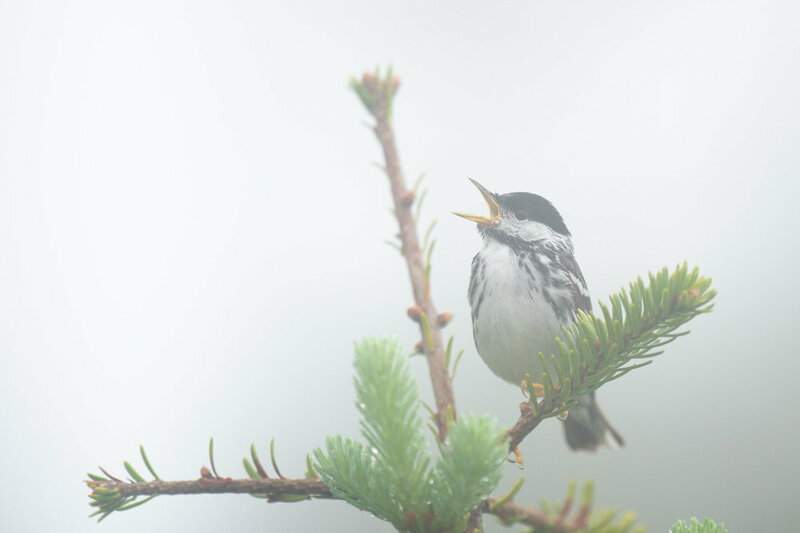 It eventually started clearing up and we were able to get some clear photos of the striking Blackpoll Warblers. We rounded out the day with some Yellow-rumped Warblers, Purple Finches, and we did manage to see a flock of White-winged Crossbills but the fog ruined the photos of that species. Overall a very successful trip and we both had solid photos of Blackpoll Warblers which was always the main goal. 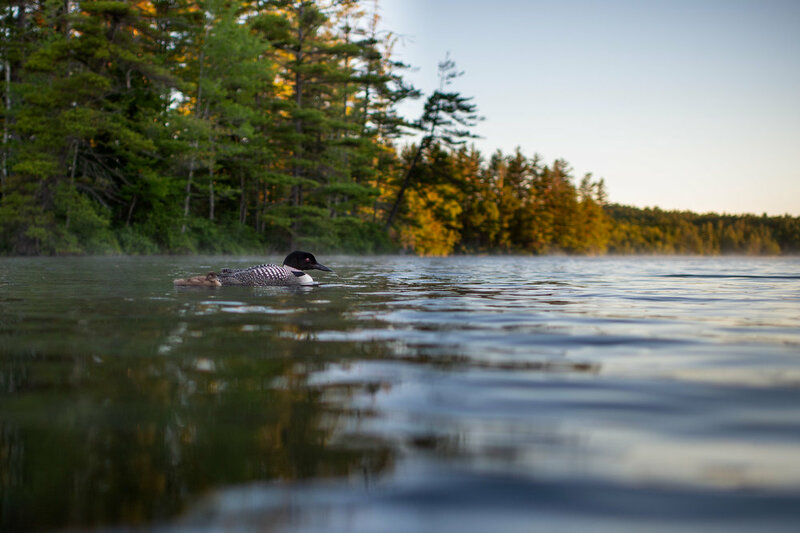 There was time that evening to go for the Loons again but we were so tired we decided to relax a bit and get ready for an early morning with the Loons before we headed home. That night before going to sleep I was looking at the weather forecast and noticed something that could be great. The temperature was going to drop significantly overnight and there would be minimal wind in the morning. I knew the lake water was warm after being in it so I thought there was a slight chance of low hanging fog on the water. With completely clear skies the potential for glowing fog sounded amazing. I mentioned this to Scott and we both sort of shrugged it off thinking what are the odds of that happening? We woke up about 1.5 hours before sunrise on our last morning in New Hampshire and made the short drive to the nearby lake. It was nice and cool as we pulled up to the kayak launch and to our amazement we had what we were dreaming of, low hanging fog on the calm lake! I think we both rushed to put together our gear and get on the water, this time we would be staying in the kayaks and hoping the Loons would be more tolerant. As we launched the kayaks we could hear the distant calling of some Common Loons as well as a Barred Owl. What a perfect morning! Less then 10 minutes on the water and we came upon our first Loon of the day, a single adult bird that was really curious about us. We both busted out our wide angle setups and tried for some interesting scenic shots. I got the one below but do wish the bird was a bit closer to me. There was a slight breeze in the middle of the lake which kept the fog away but all the smaller coves still had the fog hanging in them. Scott and I split up to cover more area to find some cooperative subjects. Our goal was to find some birds with chicks before sunrise so we could let them get used to us before the light got great. I headed in the direction of the cove we worked with the pair and their single chick on the first evening we arrived. Sure enough I found them in the same general area and waved Scott over. We slowly kayaked into the cove and to our delight the Loons did not seem to care about us one bit. 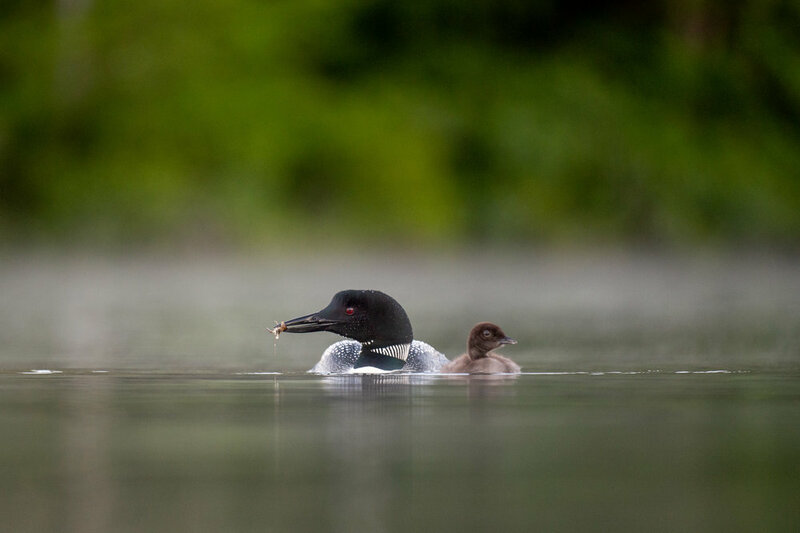 The pair gently floated along in the calm morning water surrounded by fog, their chick lazily floating between them. It was immediately apparent that staying in our kayaks was the right call. Relaxed birds with no fear and behaving normally is exactly what we wanted. The chick was still swimming behind one of the parents so I started photographing that. Moments later another of our dream shots appeared right in front of us, the little chick climbed up on the adult's back! I remember saying out loud, "is this really happening?!" We were getting the chance to photograph the chick riding in some of the nicest lighting and fog conditions, I couldn't believe it! We both fired away knowing that in the low light and with slow shutter speeds many of the shots might not come out but some would be great. It doesn't happen often in wildlife photography but when your subject accepts your presence and still behaves normally it's such a gift. To watch this pair of Loons tend to their chick right in front of us without being bothered was really something special. I paddled around a bit and started to notice the sky opposite the sunrise was turning pink. I positioned myself to capture that color being reflected in the water and again to my surprise a very tender moment between parent and chick happened right then. The adult slowly rolled over and the pair touched beaks together as if to just acknowledge each other. This day just kept getting better and better. Just before the parent decided it was time to loose its hitchhiker I had one more incredible photo appear in front of me. I had drifted in rather close to the birds and was bent in half trying to get my camera as low as possible. The parent slowly paddled away from me and I was focused on the chick riding on its back. I remember trying to will the parent in my head to turn so I could see it's profile while the chick was riding. I was practically screaming it in my head when it happened for a quick moment. The adult turned its head so that I could see both the chick and the adult as they floated in the cool dusk light with that beautiful fog in the background. One of my favorite photos of the trip happened just like that. Then the chick was dumped off and it was feeding time! 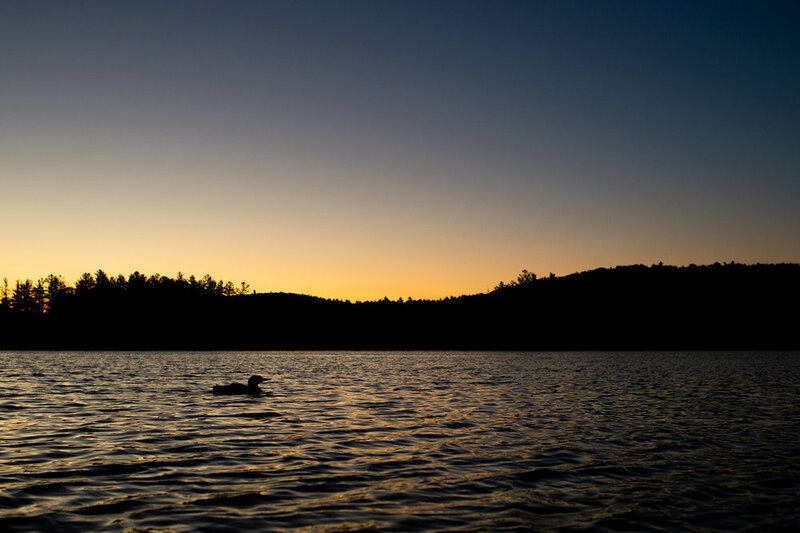 Now at this point we already had photos of Loons in great evening light from our first outing. This morning we now had portraits of the adults, the adults swimming with the chick and the chick riding on the back of an adult, all with low hanging fog on the water. The list of dream shots was growing shorter and shorter and next on that list was feeding. When the adult dived down and left the chick just floating on the surface we knew we were about to check of that next dream shot! Sure enough the parent surfaced with a small crayfish and swam over to the chick to gently feed it. At this point the trip was seeming surreal. I've had some lucky outings in my past but this was just over the top. Everything I wanted out of the trip was happening and it was just me and Scott there to photograph it. We watched the feeding for a while then just sat there floating around with the birds waiting for something else to happen. We took a few more portraits and I remember thinking what else could I do with these birds? I was out of ideas! Then I looked out across the lake and noticed the sun streaming into an area and just lighting up the fog. I pointed the lens in that direction and saw a pair of loons. I told Scott I was headed out there and paddle like crazy to get in position before the light changed too much. I paddle out into position to silhouette the pair in the glowing fog. One of them immediately took off away from me. It was odd to see them be a bit scared after the extremely close encounter I had just had. Thankfully one of them stayed just long enough for the photo below. It then took off to meet up with the other loon and I decided to head back to the original birds since chasing these guys all over the lake was not smart. I arrived back with the original loons and Scott had moved elsewhere by then so it was just me and a single parent with the chick. I paddled into a spot that looked like it would have a nice background and tried to stay put. I then noticed a small beam of sun shining through the trees in the background and illuminating the fog that was still hanging on the water. I noticed the adult and chick were headed towards this little spot of light to I got as low as possible and hoped for the best. The pair swam right through the glow and I got the portraits you see below. Again the day just somehow kept getting better and better. Most of you who follow me may know how much I love using backlight and silhouette for interesting and creative photos. The last shot on my dream list for the trip was to get a Loon backlit or silhouetted with the bonus having low fog on the water. 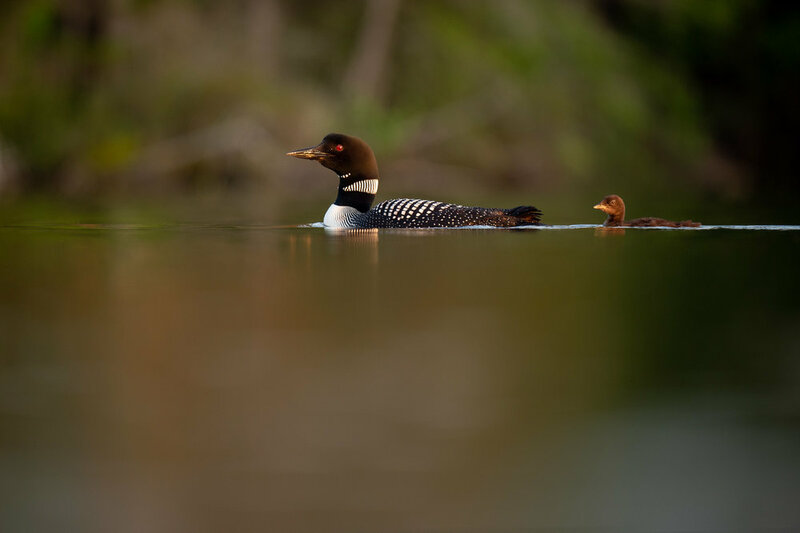 When the pair swam out into the open sunny area filled with fog and a nice dark background I had all the ingredients I needed to make that shot a reality. I initially got the photo above of the adult alone but really wanted a chick in the shot. The little one finally swam out with the adult in the beautiful morning sun and then I just had to wait until it got in position. Eventually it swam around in front of its parent and I fired away. 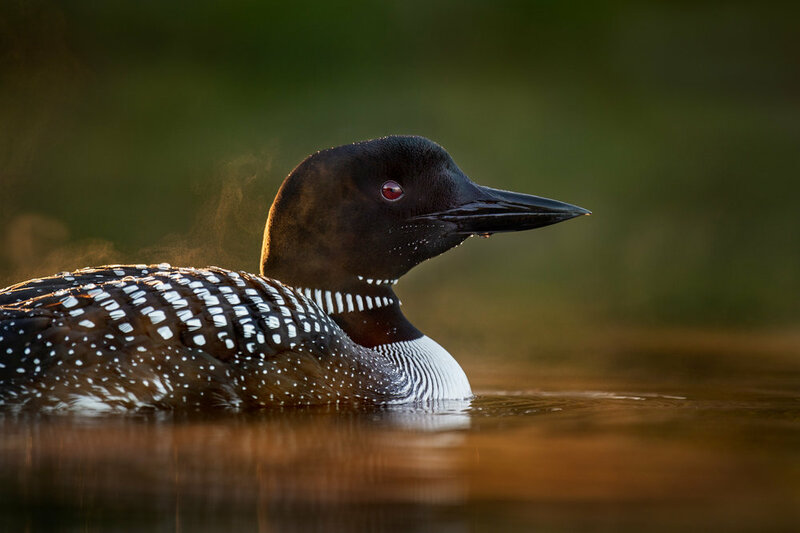 When I saw this image on the screen I was so thrilled, getting this light with the pair was more then I ever expected on this trip and it completed the checklist of dream photos from our time with the Common Loons in New Hampshire. I ended my time with the Loons by swinging around and letting the morning sun shine on them as the adult again dove down to catch food for its chick. You can see below as it swims towards the little bird preparing to feed it. 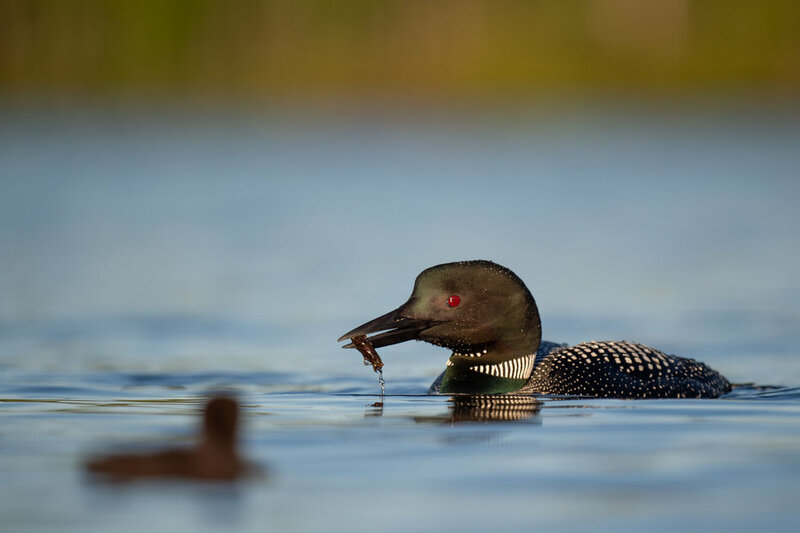 It's quite impressive how successful these loons are at catching food for the chicks, I'd say 70% of every dive I witnessed was successful with some food. I guess it's easy to find in the crystal clear waters of the lakes in this area. I took one last close up as my kayak drifted a bit too close and then left them to enjoy the day without my constant taking photos. As I paddled back to the dock I had a huge grin on my face knowing that our first attempt to photograph these amazing birds went 10x better then I ever thought it might. I can't wait to try and get back again next year, my next dream shot is a parent feeding a chick backlit with fog on the water. Hey, I can dream can't I!